The Entertainer Dubai 2017 – what’s included? The Entertainer Dubai – how does it work? 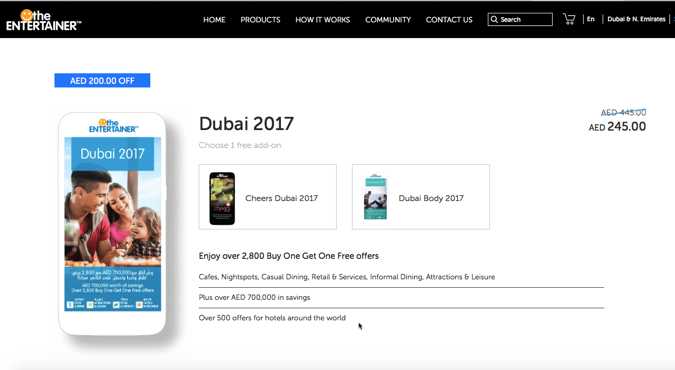 The Entertainer Dubai 2017 is available in two versions, a voucher book and an app, depending which is more convenient for you. The app is 50 AED cheaper, and is preferable to carrying two thick books around, plus there is an added benefit as it used location-based services (when enabled on your phone) to find offers closest to you. So, say you were at The Walk and Jumeirah Beach Residence and you fancied something to eat. You would simply open the app in your phone, search either venues near you by name or location, and the offers would be listed. Generally for restaurants the deal would be One Main Meal item free when one is purchased, when two people are dining. Unfortunately – and I’ve tried it – the Entertainer offers can only be redeemed for two people or more. For example, the Butcher Shop Grill offer a fantastic seafood buffet so one person would buy the more expensive item whilst the second person could pick any Main Meal item (I recommend the meat mixed grill) and it would be free. Redeeming the offers is easy, either hand over the voucher (from the book) or show the waiter your app. He will ask you to redeem, you click the icon in the app, enter your pin code and it will generate a code he will take note of. That’s it – you’ve just saved over 200 AED, and had an amazing meal also! One tremendous benefit of The Entertainer Dubai that’s often overlooked is the worldwide hotels and Travel section. This essentially offers 20% discount off Best Available Rate, or One Night Free with one purchased night. Particularly strong in Dubai, hotels such as JW Marriott Marquis Dubai and Steigenberger Business Bay offer terrific value due to The Entertainer Dubai. For more information of this amazing deal please check the detailed article here. Have you used the Entertainer Dubai 2017? What are your favourite type articles, and what would you like to see more of? Dont know if this is relevant or not..but it wud a gr8 help if u can guide on the follwing. I will be in dubai for a week from 1st till 7th sep 2016 with my wife and 2 kids (5 & 7 years). Can you tell me which of the follwing is included in KODS ENTERTAINER 2016. Shall i buy the kids entertainer 2016?